No matter what is the extent of diet-conscious fashion divas but I put my foot down when it comes to the secret behind their heights of sensual vibes they secrete while walking on the ramp. Yes, you may call it a result of their regular spa treatment or spending hours in gymnasium but to me it clearly seems to be a symptom of their too much intake of dark black chocolate cupcakes. And why not as the sinful treat makes it impossible for any women to stay away from. But little was I aware that they will choose this strategy to flaunt their love for handbags or rather goodies or to be precise cupcakes. Claiming to be the world’s most expensive cupcake (not edibily), it is a welcoming accessory to be picked by trendy women. 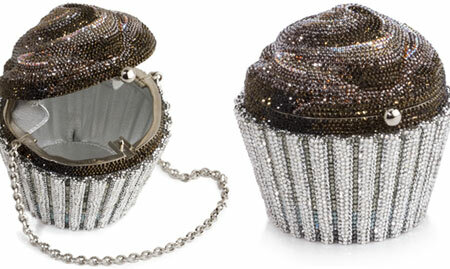 Called cupcake evening bag from Judith Leiber, it is festooned with choco colored rocks and diamonds and can offer a room for your designer gloss and accommodate few currency to pay off tips. Retailed at $4,295, this would surely not open for any sundry accessory.